Places to see in Garuchira: Garuchira is a small village in the Bandapani area of the Terai region of West Bengal. On one side are the hills of Bhutan and on the other are the forests of Sal and Teak. 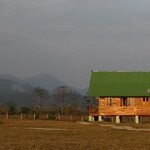 The Forest Department has developed an eco village with two Forest bungalows here. Garuchira lies amidst the jungles of Terai region which serves as the main corridor of the wild elephants migrating from Nepal. Hilly perrineal rivers like Sukti and Reti flow by Garuchira. If you are coming to Garuchira during the rainy season, then you have to cross these rivers to reach the Forest Bungalows. 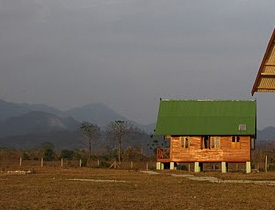 Nearby Attractions of Garuchira: Alipurduar is just 80 kms from Garuchira. You can spend a day or two at Garuchira and then move on to Alipurduar. Things to do in Garuchira: You can take a tour of the jungle with your guide and stay in the forest bungalows. Wild elephants are the main attractions of Garuchira Forest. How to reach Garuchira: From New Jalpaiguri you can hire a car to reach Garuchira via Birpara. Garuchira is an hours distance from Birpara by car. You can also reach Garuchira from Alipurduar. Garuchira is around 80 kms from Alipurduar. You can also reach Garuchira from the nearby Dalgaon Station. The Up Kanchakanya Express (13149) stops at Dalgaon. Lodging and dining facilities in Garuchira: The only lodging option are the Forest Bungalows of Garuchira. Dining is arranged by the Forest Bungalows.